Dogs keep us company when we need it most, reduce stress in an increasingly stressful world, take us on adventures and help us with the jobs we couldn’t possibly do alone. We are a nation of dog lovers and it’s not just the cute little city dogs that capture our hearts. They may not be on the bed at night, but even working dogs are very much a part of the family, as we saw recently when beloved police dog Thames went missing in the Tararua Ranges and how upset the Wakefield family were. The news media kept us updated regularly until he was found. Animal-lover and photographer Craig Bullock firmly believes that dogs make our lives better. To prove this, he’s back with another collection of arresting photographs, celebrating the very special, unspoken bond we have with our pooches. In his acknowledgements, Craig thanks the dogs for the ‘endless fun and entertainment’ they gave him on his journey around the country, tracking down some of our coolest dogs for this heart-warming book. This sense of fun is palpable, as one turns from one page to the next. Arranged into 10 groups — working dogs, lap dogs, adventure dogs, city dogs, country dogs, expedition dogs, culture dogs, companion dogs, farm dogs and champion dogs — A Dog’s Life lets us see dogs going about their daily lives. Bullock skilfully captures each dog’s individual personality as they focus on the important task at hand. 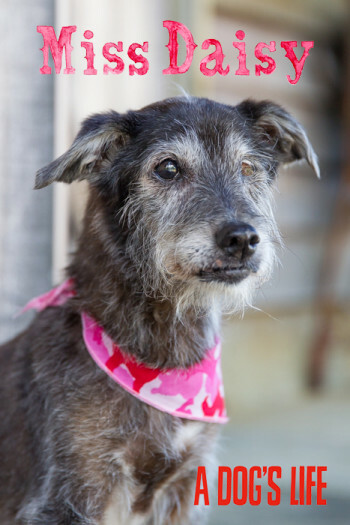 Special attention must be given first to Miss Daisy-Louise, who at 23 is possibly the country’s oldest pooch. Miss Daisy is well known to the film and prop industry, and even though this sweet little schnauzer cross is deaf and blind, she’s still enjoying life out at West Auckland’s Oratia, under the watchful eye of her vet and carer, Anthony. 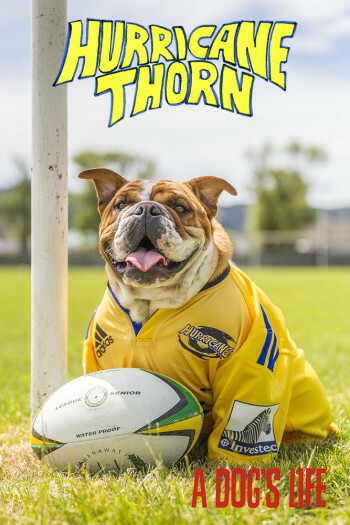 Thorn, a two-year-old British bulldog and a big Hurricanes fan, will happily slip into his own ‘small men’s’ size team jersey ahead of a big game and bark along as everyone else cheers a try. Apartment dweller Biff the bouncy Boston terrier makes weekly visits to Mars NZ Ltd, just one of an increasing number of corporates who recognise dogs’ positive impact on the workspace. From the bow of the tour boat, Labradoodle Sidney keeps a watchful look out for Hector’s dolphins around Banks Peninsula. Tessa Bella, who hails from the well-known Reid aviation family, patiently waits while her ‘mutt muffs’ are fitted before her regular chopper flight over the Tasman area. Wellingtonian dogs include Bernie the Bernese mountain dog, a regular sight down at ‘Bernie’s on the Bay’ café on Oriental parade. There are also several of the store pooches from the trendy Cuba Street district. Oamaru’s beautifully preserved Victorian Quarter is also well represented, with several pooch identities, including Oscar the Steampunk dog. Then there’s Flounder, a corgi, named so because ‘she’s short and close to the ground’, whose penchant for the fallen avocados she finds in the orchard has resulted in a super glossy coat. Four pugs always steal the show when they step out for a beach walk at Mount Maunganui, whose owner Julie describes as being ‘complete clowns, with a head tilt that could melt the iciest of hearts’. Bruno, the mascot for a Taupo white-water rafting company, with at least 100 river trips under his belt, stands right up front wearing his life jacket, loving the adrenalin rush along with all of the other tourist passengers. Border Collie Blake goes everywhere with courier driver Sam who says he doesn’t even see him as a dog, but rather a loyal family member. For two families, the book’s publication comes with a heavy heart. They’ve recently lost their canine companions, but they still wanted their stories to be told in memory of many wonderful years together. Polio sufferer Philip shared a very special bond with Diamond, a beautiful springer spaniel who helped turn his life around after he’d done jail time. Tragically, Diamond was hit by a car and died not long after the photo shoot. Lily, a magnificent standard poodle who at sixteen (a great age for a poodle) was becoming increasingly frail but still went with Rod to his vintage car workshop every day. She loved nothing more in life than to take a spin in one of his beautifully restored vintage MG convertibles. 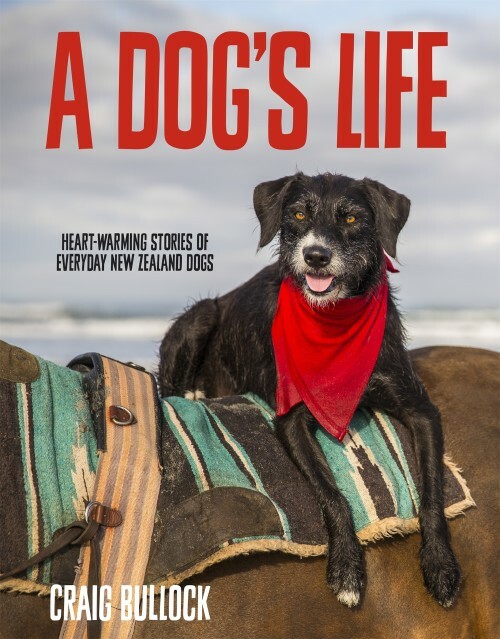 From lap dogs to working dogs, these are real-life stories of over 60 exceptional and adorable everyday Kiwi canines.